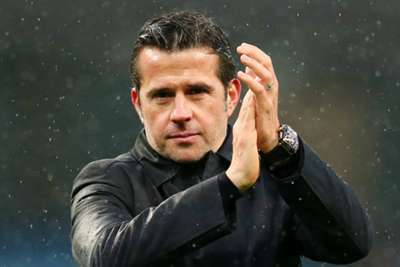 Marco Silva pointed to misses by Richarlison in his summing up of Everton's 3-1 defeat at Manchester City, but said winning at Etihad Stadium requires "perfect" defending. Brazilian forward Richarlison has scored eight goals in 15 Premier League appearances this season but he missed a golden opportunity to give Everton the lead against City, shortly before compatriot Gabriel Jesus put the home side ahead. Jesus scored once more before Dominic Calvert-Lewin headed home to give Everton hope, but Raheem Sterling restored City's two-goal advantage with his first touch after coming on as a substitute. "Manchester City deserved the three points," Silva conceded after the game. "They were more effective than us with the chances they created. "We knew before the match their qualities. We needed to be perfect in defence. "Until they scored the first goal, the game was within what we expected and planned. They did not shoot once. "The biggest chance until that moment was Richarlison's chance, a big, big chance. After that, it changed." The result left Everton without a win in their last four Premier League matches and Silva admitted his defenders need to improve. Both Jesus and Sterling were left unmarked for their second-half strikes, despite Everton having plenty of men back. "We knew they had the quality to command the match," Silva continued. "We had three against one in our box for that chance and when you have Michael [Keane] and [Yerry] Mina against Jesus and they score that means we could do better. "They score too fast the 3-1 and after we have three clear chances to score. "When you have chances like Richarlison, Richarlison again, Theo [Walcott] and Dominic [Calvert-Lewin], you have to score."